The 24th April 2015 will be the two year anniversary of the Rana Plaza building collapse, the deadliest disaster in the history of the global garment industry. Join this global day of action, uniting with people worldwide to demand justice for the victims, to hold brands and retailers accountable and to ensure that vital and lasting changes are made in the global apparel industry. On April 24, 2013, the Rana Plaza building in Bangladesh, housing five garment factories, came crashing down. At least 1,134 people lost their lives. Many were killed instantly. Many more were buried alive under eight stories of concrete and machinery, among the remains of the garments that they were producing for global corporations. Thousands were injured and severely traumatized. Some people were forced to amputate their own limbs in order to escape this concrete grave. In the days and weeks immediately following the Rana Plaza disaster, the world united in pledging support for the survivors and victims’ families. Governments, apparel brands, and the public called for urgent change to the industry. Unfortunately, change has been slow in coming, and many initial promises made have since eroded. Action remains urgently needed and necessary. Some multinational brands are still refusing to pay what they owe in compensation. This is unacceptable. Commit to taking action on, or in advance of, April 24, 2015, by signing up to this facebook event. Check if there is a demonstration already happening near you on this map. If there isn’t one that you can join, find a Benetton or Asda store near you, and plan a demonstration for April 24th with some friends. Add it to the map! On the Global Day of Action (April 24th), and leading up to then, join us to call for industry reforms, demanding that people are put above profit, and safeguarding workers’ welfare and livelihoods. We demand that Rana Plaza survivors and victims’ families receive the full compensation they are entitled to. We demand all apparel brands and retailers doing business in Bangladesh sign the Bangladesh Accord on Fire and Building Safety. We demand transparency and due diligence. We demand accountability and access to justice. We demand freedom of association and the right to collective bargaining. 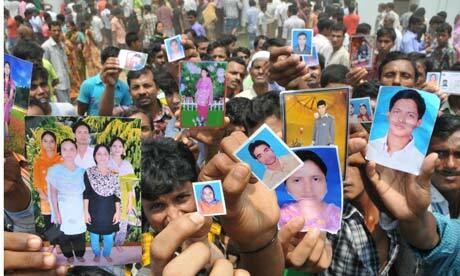 There must never be another Rana Plaza. The only way to ensure this is to thread these principles through the foundations of the industry. Together we will continue to remember the victims who died for the price of the cheap clothes we wear. Together we must secure justice for their families through full compensation. Together we can reform the industry so that all garment workers are afforded a safe and dignified life.